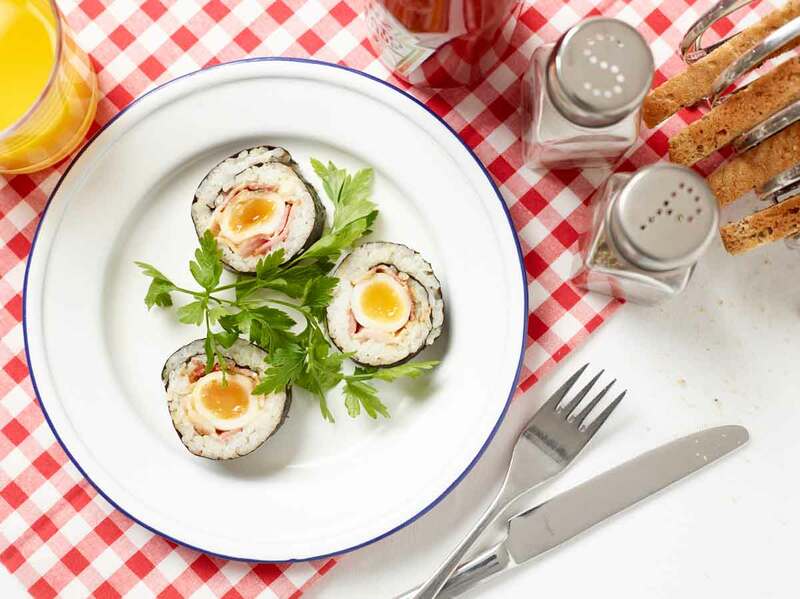 With a centre of egg and bacon this breakfast sushi treat is made with the core ingredients from your typical traditional English breakfast. 1Boil quails eggs for 2 mins - remove from heat, drain and cover with cold water. Peel and leave to one side. 2Prepare sushi rice following instructions on the pack. Once cooked, leave to one side for 30 mins. Add rice vinegar and mix with wooden spoon. 3Fry bacon until crispy, drain on kitchen roll and set aside to cool. 4Put Nori sheet on rolling mat shiny side down. Spread rice thinly on nori sheet, avoiding the edges. Place 2 or more slices of cooked bacon lengthways, add layer of eggs, and top with 2 or more slices of bacon. 5Begin rolling the sushi roll by putting fingertips of both hands on top of sushi ingredients to hold in place while keeping thumbs on the back of the bamboo rolling mat nearest you. Push the mat forward until it surrounds the sushi roll and the top and bottom edges of the nori meet. Roll the sushi mat in a circle around the ingredients. The mat can be used to shape your sushi into a long, round roll, but don’t press too hard. 6Place on cutting board. Using a very sharp knife, slice into 8 equal rolls. Try to cut in the middle of each egg so everyone gets a half. 7Serve with tea, toast and butter.